Public views of Barack Obama today are very different from those of George W. Bush at about this point in his second term. Obama’s job rating is in positive territory, while Bush’s tilted negative. But a look at the one-word descriptions of the two men finds some common ground. Most notably, the word incompetent appears high on the one-word list for each. 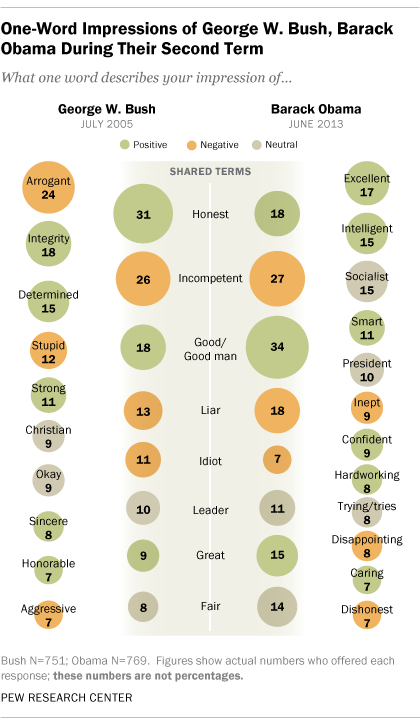 In a recent Pew Research Center survey, conducted June 12-16, variations on the word good were used most often to characterize impressions of Obama. But incompetent shows up frequently as well. In fact, it tops the list of negative terms. In July 2005, honest was used most often to describe Bush, followed by incompetent and arrogant. A caveat is in order: The accompanying graphic shows the actual number of respondents who used each word. Even the words used most frequently account for less than 1% of all responses. Yet the single-word descriptions of politicians give texture to blunt measures like job approval and favorability ratings. As Bush’s ratings declined through his second term, incompetent came to dominate his one-word descriptions. By December 2008, that word was used far more often than any other term in capturing impressions of the former president. There are other telling comparisons in single-word descriptions of Obama and Bush. Among the positives for Obama are references to his intelligence (intelligent, smart) and effort (hardworking, trying). These concepts were seldom used to characterize impressions of Bush during his presidency. There also were positive terms that came up consistently in Bush one-word surveys that have been mostly absent from the surveys on Obama. Bush was often described as determined and committed; Obama has seldom, if ever, been described this way.